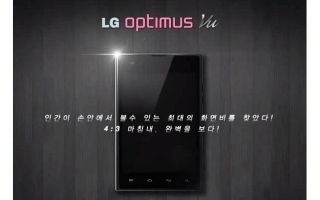 LG has released a video showing a first glimpse of the Optimus Vu, a smartphone with a 5-inch display with an unsual 4:3 aspect ratio. The Korean video doesn't reveal much else about the new handset other than its screen dimensions and a murky glimpse at its outside appearance. However, Korean sites Datacider and Google Pad have come up with some further details for the Optimus Vu between them, including a 1024 x 768px IPS display for that headline 4:3 aspect ratio. Inside, the Optimus Vu has a 1.5GHz dual core Snapdragon processor tied to 1GB of RAM and 8GB of internal storage. It also features an 8-megapixel camera along with NFC support. It's expected to run the older Android 2.3 Gingerbread rather than Google's brand new Ice Cream Sandwich OS. The Optimus Vu's 5-inch screen is getting into Samsung Galaxy Note territory, though the 4:3 aspect ratio seems like a bit of a strange choice. There's no indication of when or if it will make it out of Korea and into the UK and other territories, but as closet 4:3 fans we hope to get our hands on it soon. To cast your own eye over LG's new baby, have a look at LG's Optimus Vu video yourself.